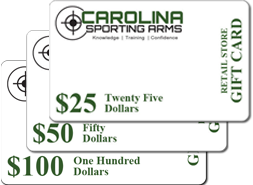 Gift cards from Carolina Sporting Arms are a great way to give the shooting enthusiast or outdoorsman in your life a gift that you know they will love and use. These are great gifts for birthdays, anniversaries, Christmas and any other special occasion. 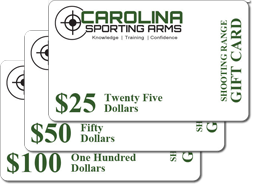 Carolina Sporting Arms offers two different gift cards for our customers. The first is our Retail Store Gift Card that allows the recipient to purchase guns, ammo, holster or any other item in our Charlotte, NC store. The second gift card is design for our shooting range. The Shooting Range Gift Card is design for purchasing range time, products, gun rentals or any other items associated with the shooting range. Hurry in today to get your loved one a gift that you know they are going love or you can purchase them online from the links below.